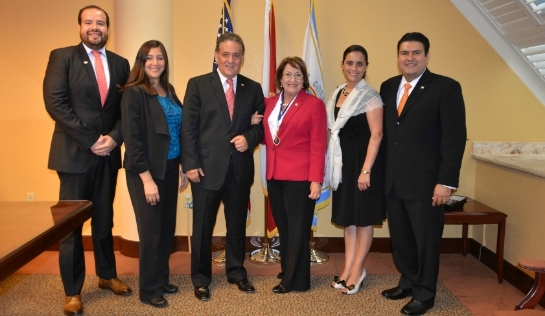 Mayor Teresa Jacobs and Orange County’s Office of Economic Development met recently with Juan Sabines, Consul of Mexico in Orlando, to discuss tourism and economic opportunities between Mexico and Central Florida. Consul Sabines and Mayor Jacobs discussed Florida’s seaports and enhancing more trade between Florida and Mexico. According to the Tallahassee-based Florida Ports Council, the state’s 15 seaports moved more than 3.3 million containers and $49.5 billion worth of containerized cargo in 2014. The conversation later turned to education and opportunities for cultural exchanges at several of Central Florida’s highly regarded academic institutions including the University of Central Florida, Rollins College and Full Sail University. Other universities in the region include the Florida A&M College of Law, Barry University School of Law, the Ana G. Mendez University System, Metro Orlando and the Polytechnic University of Puerto Rico’s Orlando campus, which is the university’s second location outside of Puerto Rico. The delegation also talked about increasing tourism between their regions and the continued growth of world famous tourism destinations in Orange County. In May, the tourism economy further solidified the region’s position as the No. 1 global destination with Visit Orlando’s momentous announcement of 62 million guests visiting the region in 2014. Consuls in Central Florida represent their respective countries and are the central point of contact for all trade, cultural and diplomatic liaising between their country and the local community. The delegation accompanying Consul Sabines included Adjunct Consul Roberto Nicolas, Consul of Protection Rodrigo López Portillo and Community Affairs Consul Juanita Cardenas. A collection of photos from the meeting are available for use by the media on Flickr.